(Bloomberg) -- U.S. stocks eked out a small gain as a better-than-expected jobs report and signs of progress in trade talks overshadowed a disappointing sales forecast from Amazon. The S&P 500 Index rose less than 0.1 percent, extending a weekly advance to 1.6 percent. 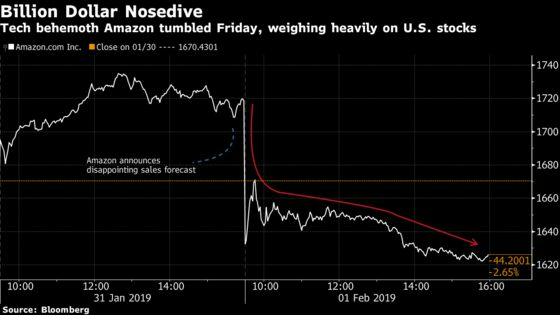 Tech-heavy gauges slumped as Amazon capped a 20 percent drop from its September high. Energy companies were the best performers as oil rose to the strongest in more than two months and data showed nonfarm payrolls increased by 304,000 last month, the most in almost a year. The dollar was steady and U.S. Treasury yields rose. After U.S. stocks posted their best month in three years in January on the back of dovish Federal Reserve comments, traders are keeping a careful watch on earnings season for signals about the outlook for growth. China promised to boost purchases of U.S. goods after the latest round of trade talks, and both sides planned further discussions. “Having strong data back up the view that the economy is on a strong footing is good, but still there’s some lingering uncertainties out there, particularly with global trade,” said Charlie Ripley, a senior investment strategist for Allianz Investment Management. Oil climbed past $55 a barrel in New York, reaching the highest since November, amid falling OPEC production and speculation that a robust economy will fuel demand. Elsewhere, European equities climbed. The pound weakened as data showed U.K. manufacturing fell to a three-month low in January. Asian stocks headed for a fourth consecutive weekly advance. The coming week will see central banks reviewing monetary policy, including the Bank of England, in Australia, Brazil, Mexico, Russia, Serbia, Philippines, Thailand and India. Earnings season rolls on with notable releases from Alphabet, Toyota, BP and Disney. Chinese financial markets will close next week for the Lunar New Year holiday. The S&P 500 Index rose 0.1 percent at the close of trading in New York. The Stoxx Europe 600 Index rose 0.3 percent. The MSCI Emerging Market Index was little changed. The euro increased 0.1 percent to $1.146. The British pound declined 0.2 percent to $1.3082. The Japanese yen fell 0.6 percent to 109.5 per dollar. The yield on 10-year Treasuries rose six basis points to 2.69 percent. Germany’s 10-year yield climbed two basis points to 0.16 percent. Britain’s 10-year yield rose three basis points to 1.24 percent. Italy’s 10-year yield jumped 16 basis points to 2.74 percent. West Texas Intermediate crude rose 2.9 percent to $55.33 a barrel. Gold fell 0.2 percent to $1,319.07 an ounce.